2 ½ – 6 years approx. To introduce the child to the locations of the continents. The rough sandpaper continents versus the smooth ocean. The continents are all slightly raised so that the child can feel the relief as well. Ask the child to watch how you carry the globe to the table. Show the child how to carry the globe to the table with one hand supporting the base and the other supporting the globe. Place the globe.. on the table on the work mat. Remind the child that our world is made up of land and water but the land on this globe is represented by the sandpaper. 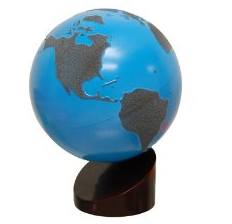 This is called the Sandpaper Continents Globe. Invite the child to feel all the continents. love the montessori materials ,please sign me in,thanks. Cool ideas,can’t wait to try it when school resumes. Pls sign me on too! 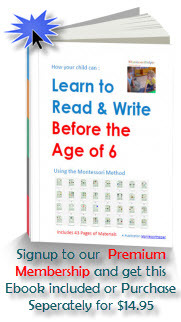 I love this am a Montessori teacher please sign me in I will love to learn more.